Rescue workers have found four more bodies in the rubble of the Genoa bridge collapse, raising the death toll from 38 as at Friday to 42 Saturday morning. This happened just as mourners filled a fairground pavilion for a state funeral for many of the victims found in recent days. Funeral mass for Italy bridge collapseItalian RAI state radio said what was believed to be the body of the last person missing in Tuesday’s collapse of the Morandi Bridge was that of a 30-year-old man. A few hours earlier, the bodies of an Italian couple and their 9-year-old daughter were found in their smashed car under a big block of concrete, part of tons of material that crashed 45 meters (150 feet) into a dry riverbed and nearby areas when the heavily trafficked major highway span gave way. Relatives had said the family, from northern Italy, had been traveling to catch a ferry for the island of Elba, while on vacation. 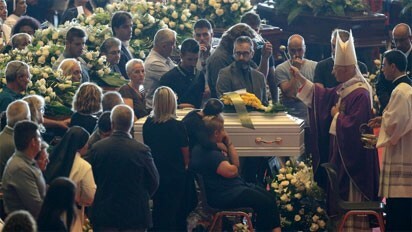 Others opted for private funerals, including one a day earlier for four friends, young men in their 20s, from the southern town of Torre del Greco. At that service, relatives angrily denounced authorities for what they contend is failure to keep the bridge safe.